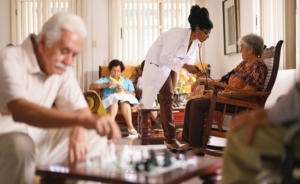 Many seniors prefer to remain in their own homes as they age. But for some, living independently is no longer an option. Assisted living can offer seniors a safe and supportive living community while continuing the sense of independence that they cherish. Yet making the move can be fraught with emotion. Change is difficult for many people. Seniors may associate entering assisted living with giving up control over their own decisions, losing their home, and seeing their quality of life diminished. Begin preparing for the move as early as possible. Discuss the concept months or even years before it becomes a reality. This will allow the senior to have as much input into the decision as possible as well as time to adjust to the idea of changing their living arrangements. It also provides the opportunity to carefully select the facility that best meets their needs and preferences. Location – will my loved one be nearby friends and family? Medical services – can my loved one continue to see his or her own physicians? Does the facility have its own medical providers on staff? Recreation – does the facility offer programs and activities that align with my loved one’s interests? Future needs – does the facility offer various levels of care in the event that my loved one requires more assistance or specialized care such as a memory loss unit in the future? Become familiar with assisted living options by visiting several facilities and participating in any special events that they may offer. Help your loved one begin to downsize as far in advance as possible. Encourage them to donate unwanted items, raise money by having a yard sale, and hand down precious possessions as heirlooms. Try to recreate home within the new living quarters. Place furniture in a similar configuration to the lay-out at home. Hang familiar photos and artwork, and place cherished decorative objects around the new living space to foster a sense of familiarity. Visit often, but don’t hover during the initial move-in period. You don’t want your loved one to feel forgotten, but you want to make sure he or she has the opportunity to meet new people and engage in activities. Encourage participation. Find opportunities for your loved one to join activities that are commensurate with his or her abilities. Perhaps she can volunteer within the facility, join a club, or attend outings or movie screenings. Your loved ones’ hobbies and activities should continue to be enjoyed within the facility. Most importantly, try to look upon this move not as the end of a way of life, but as the beginning of a new chapter. Maintain a positive outlook about this transition and encourage your loved one to view the move in a positive light as well. Many seniors thrive in assisted living, knowing that they can continue to enjoy the things they love without the responsibilities of cooking, cleaning and caring for a home, while reducing the burden of worry on their families.